One thing leads to another and before long he is busy with a new activity: The restoration of historical buildings. Between jobs, Claasen restores a small fishing boat for private use. 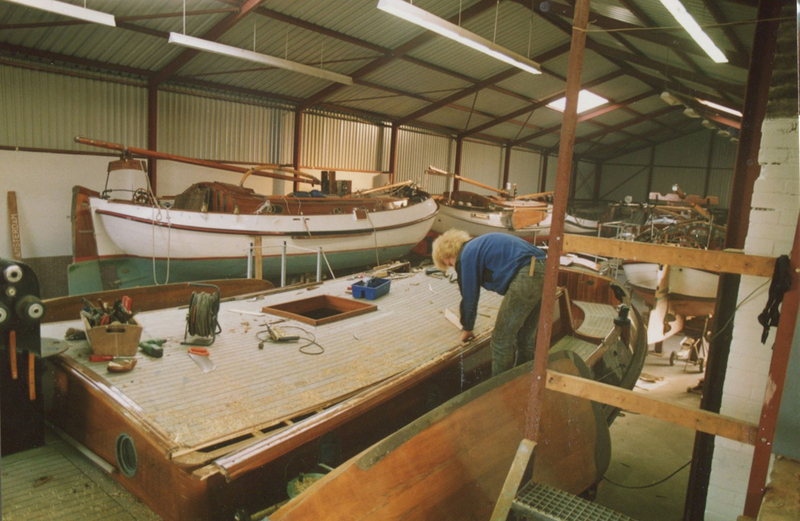 This would be his first step on the road to a glittering career in yacht building as he was then asked by Wout Bruijnzeel to assist in the restoration of two wooden motor boats. Next he is contacted by the owner of a Nordia with a bare hull, who asks Claasen to build the superstructure and interior. The owner of a stunning Lemsteraak sailing boat, built by Stofberg in Leimuiden, hears about Claasen’s craftsmanship. He asks him to complete the joinery on his traditional Dutch yacht. As the boat is in an unsuitable place a more convenient location is found. And thus it is that Claasen Jachtwerf goes into business in a Romney Shed that becomes available in Zaandam, offering at least 300m2 of space. The new location provides excellent access by road or water and also offers the possibility to carry out even larger projects. The businessman grasps the opportunity and, armed with his knowledge of woodworking techniques and a unique collection of self-made tools, Claasen creates a yacht interior of unprecedented class and quality. Claasen chooses a Turkish knot as the highly appropriate logo for his business and, to this day, the pretzel shape continues to adorn the company’s stationery.